I’m sorry by the way if late returning comments–a really busy week. Sorry also that the drawing is a recycled one. Just a hard week. This entry was posted on April 21, 2016 at 9:20 pm and is filed under elephants, poetry, Uncategorized. You can subscribe via RSS 2.0 feed to this post's comments. 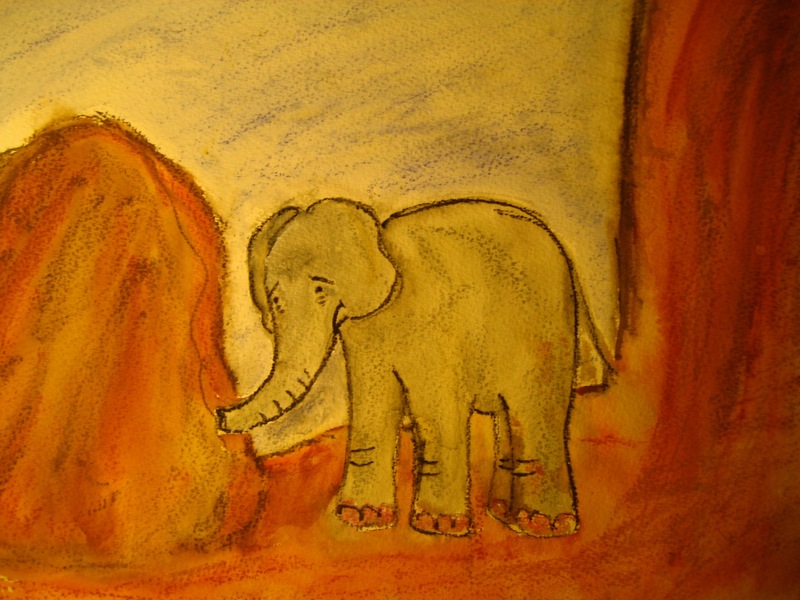 Oh the sad eyes in your painting….I LOVE the whole idea of an inner elephant. I think I will adopt that idea (I already have the neck for it, LOL)………..LOVE the poem, so sorry work is hell……..grrrrrrr. You might need to swing your trunk around a little, and let out a bellow or two. That might clear the air. Tomorrow is Friday. Thank God. I adore the feeling of that inner elephant, and I feel so envious of the elephant concept being so female… the male elephant seems to be more of a raging bull or a lonesome miser… the last stanza really wraps it up perfectly. I felt when I was writing my own, and again reading this one, k, how powerful a spirit animal the elephant is, how many forces it can represent, and how close we are to it and its ways. Lovely work with the metaphor throughout this. Thanks. It is a very iconic animal and very powerful. The face is so sympathetic seeming and noble too. k.
Yes, the eyes in particular are so human–maybe because of their small size in that great wise head. Yes, and the defined lashes. Agh. k.
Ah, I had to come over to read one of your elephant poems. I understand that inner elephant feeling. Ha! That ending. No doubt!